Last Wednesday I packed my bags for the first time in 6 weeks and hit the road again. A week later, I’m sitting in the food court in KL’s central station, where there’s free wifi, food and (most importantly) handy tables where I can sit all day writing. After staying put for 6 weeks, hitting the road again was…this is weird for someone like me to say….disorienting. 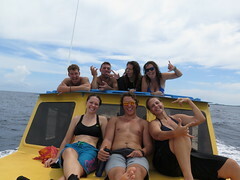 My body wanted to go diving, my heart wanted to spend more time with my becoming-friends at Scuba Junkie, and my head couldn’t grasp the concept of trip-planning and logistics. It was a trip I wasn’t ready for. Luckily, DrC was ready: he found a hostel in KL, hired a car, and planned a few spots to explore in Peninsular Malaysia. After leaving KL we visited Georgetown, an old British settlement on the island of Penang, off the northwest coast. Unlike Melaka, Georgetown was only vaguely interesting, for about a day. On the second day we toured the island, visiting a fruit farm and eating durian that did *not* smell like feet. In fact, durian tastes like rich butterscotch pudding. Delicious. I slowly started to get back into the travel groove. I read the Lonely Planet. I looked at maps. I even took some pictures. Suddenly I was impatient to get some time alone, to write. But it’d have to wait a few more days, for DrC to leave. After Penang we drove east to the Cameron Highlands, nice and cool at 2000 meters. 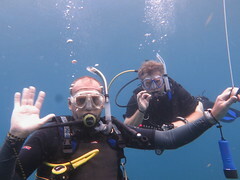 On the way there I got an email from Scuba Junkie, inviting me back to work as a DM. I was pleased, of course – this is what I had wanted before I left Semporna. But now I was traveling again, thinking about going to Thailand, hoping to go to Siberia for my birthday. Unlike most places, Semporna was less appealing in my mind, from afar, than it had been in person. Did I really want to go back, to stay still for *months*? I did. I agreed to go back for at least 3 months (until my birthday in early March), and take it from there. In the meantime, DrC and I continued uphill. Everything in the highlands is soaking, dripping wet and covered with spongy greenery. When we arrived, starving, we ate chicken tandoori followed by strawberry crepes with coffee, waiting out the rain. We visited the tea plantations, which carpet the humid hills like peat moss. Before I could go back to Borneo, I would have to do a visa run (cross the Malaysian border and back to get a new 3-month visa). I figured I’d just find a cheap AirAsia flight to Thailand or wherever when I got back to KL, but DrC had other ideas. We would make a mad rush to the Thai border near Kota Bahru. He would stay in Malaysia while I crossed the border (and back) on foot. Then we’d carry on down the east coast of Malaysia. So that’s what we did: On Sunday we drove from the tea plantations near Tanah Rata to Gua Musang, in the less-touristed Kelantan province. On Monday we woke up early and raced north to the Thai border. I was across and back in 40 minutes – not even enough time for a green curry. Knowing we had to be in KL by noon the following day, we drove most of the way down the coast, to Kuantan, that afternoon. About 400 km of driving in hot, humid weather = two rather cranky people. At our rather seedy hotel, I stomped on a cockroach, climbed into bed and was asleep before DrC finished telling me he was going to take a shower. Back in KL I gave DrC a big hug goodbye and checked into the Backpacker Traveller’s Inn, a hostel in Chinatown. It’s only 11 Ringitt/night (about $3.50), but you get what you pay for: a cramped 7-person dorm with no free Wifi, no fan and a/c that is only turned on from 9 pm – 9 am. Oddest of all: midnight is lights out. Which means one of the managers slips into the room, wordlessly switches off the light, and slips out again. No matter if you’re reading, talking, brushing your hair – she just switches off the light, without warning or regard to the people in the room. I had planned to stay in KL for a week to write and whatnot, but given the state of my accommodation, I panicked – I admit it, I panicked – and booked the first reasonably priced flight back to Semporna. So I go back tomorrow, on Friday, with too much writing left to do. I’m regretting it now, but what can you do? I’ll find some time and space to write when I’m there. And that’s the tension, the undercurrent to the past week. When I was moving all the time, I could find some time to write because I had no social obligations. When I was doing my DM, it was impossible to write – not just because of the long days, but because part of the deal was to get to know the rest of the staff. And that takes time and mental energy. Now that I’m going back, and to a place where I have already established some relationships, I’m hoping I can relax and write more. Gawd I wish I was able to just sit and write something real (not just notes) in a stolen half-hour here and there. But I can’t. Sux. OK, that’s the catch-up post. 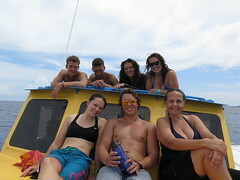 So the plan is to divemaster by day and write by night and on my days off. The theory is that my DM job is like a waiter job – a day job that pays my expenses, with any money I make from writing going into “savings.” Of course, I *love* diving, so it’ll be the best day job possible. Traveling, writing and diving. What more could a girl want?